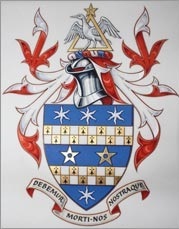 Arms: Azure two pierced mullets or between to bars counter gobony erminois and argent all between in chief three estoiles and in base a single estoile argent. Crest: Upon a helm with a wreath argent azure and gules passant through a triangle iron ensigned by a pierced mullet or a stork wings displayed and inverted argent mantled gules doubled argent. Motto: Debemur Morti Nos Nostraque (Both ourselves and our creations are a debt owed to Death). 1b •Isabella Marie-Lousie FISKE HARRISON, born at Singapore 29 October 2003. 2a Jules William Fiske HARRISON, born at London 27 July 1969, educated at Westminster, and died unmarried in a skiing accident at Zermatt, Switzerland 4 April 1988. 3a •Alexander Rupert Fiske HARRISON later FISKE-HARRISON, (Clubs: Travellers, Gridiron) playwright and actor ‘The Pendulum’ West End, London 2008, producer Mephisto Productions 2009, bullfighter ganaderia Saltillo 2010, author Into The Arena: The World of the Spanish Bullfight, Profile Books, 2011, author Fiesta: How To Survive The Bulls Of Pamplona, Mephisto Press, 2013, Non-Executive Director Fiske PLC 2014, born at London 22 July 1976, educated at Eton, University of Oxford (MA), London School of Economics (MSc), and Stella Adler Conservatory of Acting, New York, USA. The family of Fiske has long flourished in the counties of Norfolk (recorded as landowners in the Domesday Book) and Suffolk, and derives from the old Norse name of Fiskr. Legend holds that they arrived with the invading forces of Olaf Tryggvason, King of Norway, at the Battle of Maldon on the Blackwater River in Essex in 991 A.D. Daniel Fisk, of Laxfield is mentioned in a document issued by King John, confirming a grant of land in Digneveton (Dennington), made by the Duke of Lorraine to the men of Laxfield 1 May 1208. Arms: Chequy, argent and gules, on a pale, sable, three mullets or. Crest: on the top of a triangle an estoile. 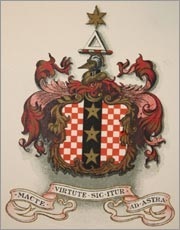 Motto: Macte Virtute Sic Itur Ad Astra (Blessed be your courage, this is the way to heaven). 1a WILLIAM FFYSKE, see below. 1f Nathan FISKE, went to America in 1642 and settled at Watertown, Massachusetts, born 1615, married Susanna, and died 1676, having had issue (see Burke’s Families of the USA FISKE formerly of Laxfield). 3a John FFYSKE, born at Laxfield circa 1428, and was buried at Diss, Norfolk circa 1488. 4a Edmund FFYSKE, born at Laxfield circa 1430, married Margery, and died 1494 (will dated 7 August 1494 and proved 4 October 1494, and was buried at Bury St Edmunds, Suffolk). 5a Margaret FFYSKE, born at Laxfield circa 1432, married Dowsing. (cont) SIMON FFYSKE, married second Katherine Crispe, and died 1464 (will dated 22 December 1463 and proved 26 February 1464). 1a THOMAS FFYSKE, see below. 1k Mary FISKE, baptised at Shimpling 18 September 1740, married Rev Temple Chevallier, MA, of Aspall Hall, Debenham, Fellow of Magdalen College Cambridge 1763, and had issue (whose great-grandson was Field Marshall Earl Kitchener (see Burke’s Peerage FIELD MARSHAL EARL KITCHENER). 1m Thomas Haynes HARRISON, one of the first body of colonists who sailed in 1850 to found the Canterbury Settlement, New Zealand. 2m Rt Rev William Thomas HARRISON, MA, DD, Bishop of Glasgow and Galloway 1888–1903, born 22 September 1837, educated at Trinity College Cambridge (MA 1863, DD 1889), and died 11 December 1920, leaving issue. 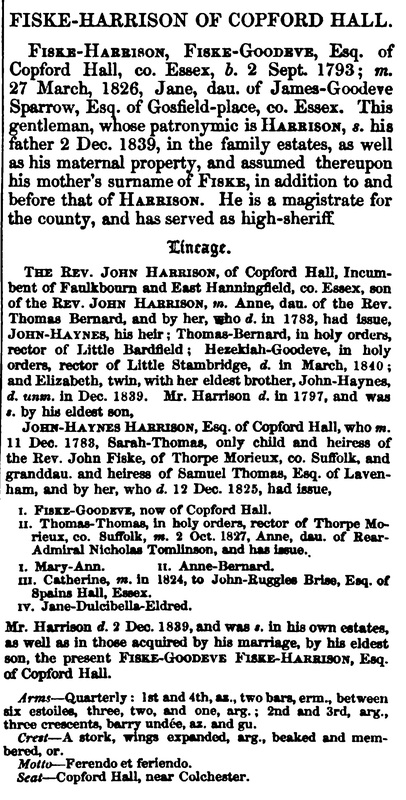 3m Catherine HARRISON, married John Ruggles Brise, of Spains Hall, Essex, and Clare, Suffolk, JP, High Sheriff of Suffolk 1829, and had issue (see Burke’s Landed Gentry of 1972 RUGGLES-BRISE OF SPAIN’S HALL, ESSEX). 3a Augustine FFYSKE, born at Laxfield 1456, married Joan, and died 1508 (will dated 15 March 1508 and proved 11 April 1508, and was buried at Laxfield). 4a Robert FFYSKE, married first 1500 Susan Lea, daughter of John Lea, and had issue. 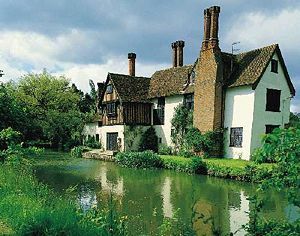 5a Sir John FFYSKE, of Holton, Suffolk, priest, born at Laxfield circa 1454. 6a Simon FFYSKE, born at Laxfield circa 1460, married Elizabeth, and was buried at Laxfield 1538. 7a Margery FFYSKE, born at Laxfield circa 1450. 8a Margaret FFYSKE, born at Laxfield circa 1452. 1c Nicholas FISKE, Professor of Physic, granted Arms 1633, baptised at Framlingham, Suffolk 31 July 1575, married Judith Reade, daughter of William Reade, of Colchester, Essex, Parson of Trinity Church and of St Martins Lane, and was buried at St Pauls, Covent Garden, London 1658. 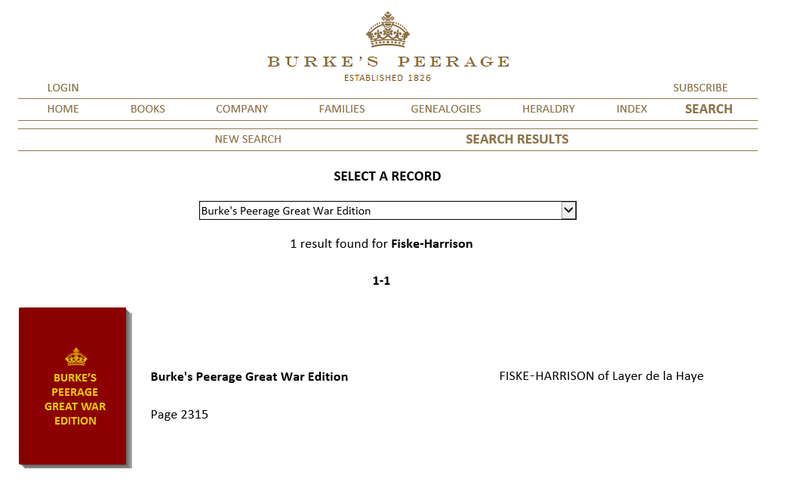 Note: Below is the Abergavenny record from Burke’s Peerage which shows the Plantagenet line which ends in the Fiske-Harrison family. Prince George Plantagenet, younger brother and heir to King Edward IV (although he was beheaded before succeeding and his brother Duke of Gloucester crowned King Richard III) married Lady Isabel Neville, daughter of Richard Neville, 16th Earl of Warwick, the most powerful nobleman in England known as ‘Warwick the Kingmaker’ for his actions in the Wars of the Roses. Their daughter, Margaret Plantagenet, Countess of Salisbury, was the only woman in that period to be a peer in her own right, and was one of the richest nobles in England. Due to the dynastic threat she posed, and her loyalty to the Church of Rome, she was beheaded by the usurper Henry VIII of the House of Tudor, her cousin. Pope Leo XIII beatified her as a martyr for the Catholic Church on 29 December 1886. 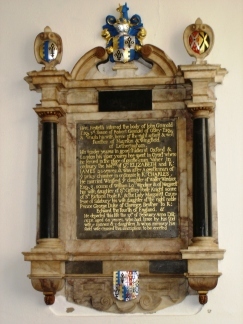 Here resteth interred the body of John Gosnold 3rd Sonne of Robert Gosnold of Otley, Esq. & Ursula his wife borne of the right ancient & wor; families of Naunton & Wingfield of Letheringham. He departed the life 17th February Anno Dni: 1628 aged 60 years, who had issue by his said wife 5 sonnes & 3 daughters to who’s memory his said wife caused this inscription to be erected. 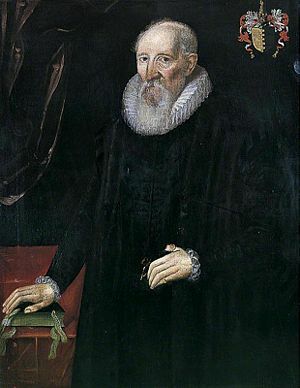 Robert Gosnold, 1534-1615, father of John Gosnold. married Ursula Naunton (1545-1615), daughter of Sir William Naunton (1506-bef. 1557) and Elizabeth Wingfied (c. 1520-1530 d. 1592). Ursula’s maternal grandparents were Sir Anthony Wingfield of Letheringham, Suffolk and Lady Elizabeth de Vere Wingfield, daughter of the John de Vere, 13th Earl of Oxford. John’s eldest son Robert Gosnold was born in 1587, married Anne Talmache or Tollemache on Feb 20th 1609 at Helmingham, and died d.1633. His eldest son Robert Gosnold was baptised May 12th 1611 and married Dorothy Jegon. His eldest son Reverend Lionel Gosnold was born 1640, married Rebecca Hardy and died 1702. HARRISON, Clive Fiske; s of William Henry Fiske Harrison (d 1992), and Evelyn, née Stubbs (d 1990); b 23 November 1939, Colchester, Essex; Educ Felsted, Trinity Hall Cambridge (MA); m 1965, Barbara Gail, née Horne; 3 s (Byron b 1967, Jules b 1969, Alexander b 1976); Career Panmure Gordon 1961, Hodgson & Baker 1965, fndr Fiske plc 1973 (currently chm and ceo); memb: London Stock Exchange 1965, Securities Inst 1990; Clubs Garrick, Reform; Style— Clive Fiske Harrison, Esq, Contact 114, Eaton Square, Belgravia, London S.W.1. Fiske-Harrison (Copford Hall, co. Essex). Quaterly, 1st and 4th, az, two barz erm. betw. six estoiles, three, two, and one ar. ; 2nd and 3rd, ar. three crescents barry undée az. and gu. Crest (italic) – Out of a ducal coronet or, a talbot’s head of the last guttée de poix. Arms: Gu. a chevron arg. surmounted by another az. between three bustards ppr., in the centre chief point a bezant. Crest: A stag’s head erased, transfixed through the neck by an arrow in bend, point to the dexter, all ppr., and between the attires a horseshoe or. Supporters: Dexter, a camel ppr., bridle, trappings and line pendant, reflexed over the back gu., gorged with a collar or, suspended therefrom an escutcheon paly bendy az. and erm., a canton of the last, charged with a portucullis gold; sinister, a gnu ppr., gorged as the dexter, suspended therefrom an escutcheon erm. charged with a chevron engrailed vert, thereon four horse-shoes, also gold. Motto: Thorough. Creations: V. (UK) 11 July 1902 (Kitchener of Khartoum); E., V. (Broome), and B. (UK) 27 July 1914. 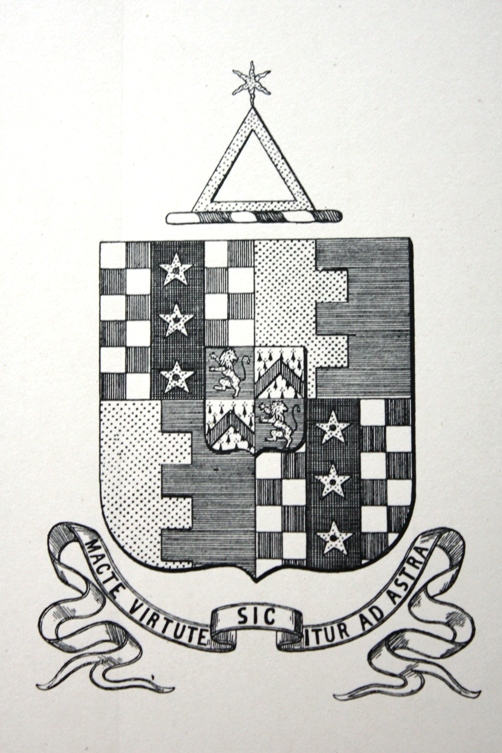 Arms: Quarterly, 1st and 4th, gu. on a mount vert a lion passant-guardant or, supporting with its dexter paw the Union flag flowing to the sinister ppr., and over the same in chief the words ‘China’, ‘India’, in letters of gold; 2nd and 3rd, az. on a fess arg. between three boar’s heads couped or a lion passant gu. ; in the centre chief point, pendant from a riband arg., fimbriated az., a representation of the badge of the Spanish Order of Charles III ppr., and on a chief a representation of the east wall of the fortress of Tarifa with a breach between two turrets, the dexter turret surmounted by the British flag flying, all ppr. Crests: 1 (centre) A boar’s head, couped or, 2 (dexter) On a mural crown arg. a lion passant-guardant or, holding in the dexter paw two flag-staves in bend sinister ppr., one, the Union flag of Great Britain and Ireland, surmounting the other, the staff thereof broken, with a triangular banner flowing therefrom to represent a Chinese flag, having thereon a dragon, and in an escroll above the word ‘China’, 3 (sinister) A dexter arm embowed in facings of the 87th Regt (gu. 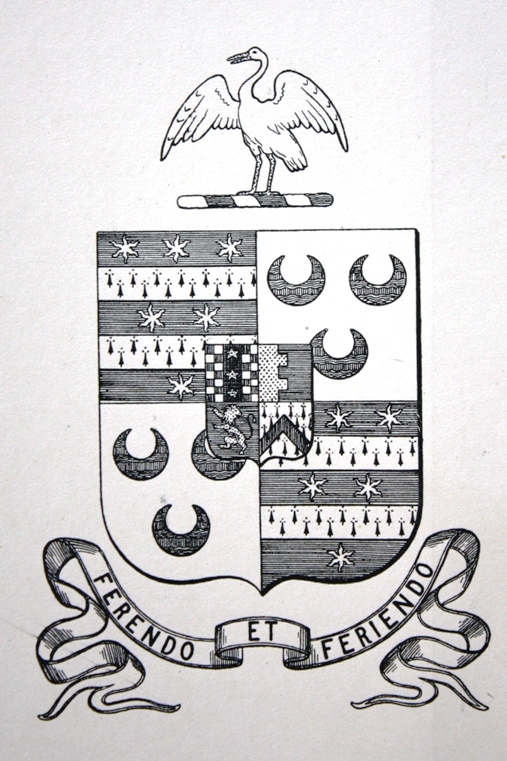 faced vert), the hand grasping the colour of the said regiment displayed, and a representation of a French eagle, reversed and depressed, the staff broken ppr., in an escroll above the word ‘Barossa’. Supporters: Dexter, a lion regardant or, gorged with an eastern crown gu., with chain reflexed over the back gold, the rim of the crown inscribed ‘Punjab’ in letters also gold; sinister, a Chinese dragon or, gorged with a mural crown sa., inscribed with the word ‘China’ and chained gold. Mottoes: Over the centre (family) crest ‘Faugh a Ballagh’ (‘Clear the way’); under the arms ‘Goojerat’. Creations: Bt. (UK) 23 Dec 1842, B. (UK) 25 April 1846, V. (UK) 15 June 1849.